Formerly known as the San Diego Stadium, the Qualcomm Stadium is located in San Diego, California. Famous in the world for its size and diversity, the Qualcomm Stadium is a multipurpose stadium hosting football, baseball, soccer games, concerts and conventions. Home for the San Diego Chargers (NFL) and the San Diego State University (Aztecs College Football Side), the stadium which is also known as "The Q" is a sight to watch out for. Tourists around the world when come to San Diego have a dream to see "The Q". The arena was built in 1967 and is owned and operated by the City of San Diego. It's the only stadium to host both, the World Series and the Super Bowl in the year 1998. Also "The Q" has hosted 3 Super Bowl games, Super Bowl XXII (1988), Super Bowl XXXII (1998) and Super Bowl XXXVII (2003), and Major League All-Star Games in 1992 and also in 1978. It was in the early 1960's that Jack Murphy (a sportswriter) began to gather people for a stadium in San Diego that was multipurpose in nature. The stadium was built with a seating capacity of 50,000 and was named as the Jack Murphy stadium. The San Diego Chargers played the first ever game in the stadium. Years after its construction, the capacity of the stadium was raised making it fully enclosed, also installing a state of the art scoreboard. In 1997 the stadium was named as the Qualcomm Stadium because the naming rights were bought by the Qualcomm Corporation. The Qualcomm Stadium has hosted many soccer matches, including FIFA tournaments such as the US Cup, Gold Cup and many friendly international matches of Mexican National Team. The match between Argentina and Mexico which was played recently set an all time record attendance for the stadium in the region. The stadium has also hosted matches between the most famous soccer clubs of the world, such as the showdown between Club America and Portsmouth FC which was watched live by millions around the world. The arena also hosts other sports events such as the Old Mission Beach Athletic Club who play Rugby at the small stadium nearby known as the "Little-Q". Also Monster Truck events and the BMX Motocross have been held at the stadium. The parking area has been converted to accommodate music and entertainment events with a capacity of over twelve and a half thousand, adding flare and diversity to this great and historic stadium. Concerts of stars like Guns N Roses, Metallica, U2, The rolling Stones and many more have been held here, setting up record in attendance numbers. American Idol auditions were also held here. So we are offering you the Qualcomm Stadium Events Tickets which is your chance to be in this great and historic stadium for sports, music and other events. Tickets for these events may be hard to get, so hurry up and don't miss this chance, grab your Qualcomm Stadium Events Tickets now! The average Qualcomm Stadium Tickets will cost you $59 for the event being held on 31/08/2019 at SDCCU Stadium, San Diego. The minimum get in price is $46 at SDCCU Stadium. Can i buy soccer game tickets at the door in qualco from you? Qualcomm stadium Tickets can be collected from the venue on the day of the event, provided you book them with us prior to the event. This system is called will call. From where can i get the schedule of qualcomm football events? The event schedule is placed on our page. Check out the directions and place the order for Qualcomm Stadium Tickets as soon as possible. Can i view the qualcomm stadium seating chart soccer before buying the tickets? Yes you can. Please go to Qualcomm Stadium Tickets page on our site and over there you will find the option of viewing the seating map. Is there a way i can have an idea of the qualcomm stadium seating before i order my tickets? Yes there is. Visit our Qualcomm Stadium Tickets page and there you will find the seating chart of the venue. How soon can I buy chargers vs bengals dec 20 tickets? You can buy Chargers VS Bengals tickets as soon as they are made available to us. They are up for grabs now. Can I buy soccer games at qualcomm tickets from the venue? Yes, you can book your Qualcomm Stadium Tickets directly from the designated counters at the arena itself. Can you please tell me the dates for soccer games in qualcomm stadium? You can look through the page of Qualcomm Stadium Tickets for your required details about the event. Please get me some qualcomm tickets,I need them ? Go get your choice of Qualcomm Stadium tickets now and do not forget to enjoy our amazing discount. 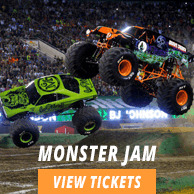 Do you sell tickets directly from qualcommstaduim.com? We are not affiliated with any website and the tickets listed here are sold by ticket-brokers. When will my soccer games qualcomm tickets be delivered to me? Your Qualcomm Stadium Tickets will be delivered as per the time conveyed when you booked them. Do you offer discounts for mexico vs venezuela soccer game? Qualcomm Stadium Tickets are with us at great discounts so book them and enjoy life. I need to get some chargers new stadium tickets? You can take your pick from Qualcomm Stadium tickets. When do qualcomm stadium events tickets go on sale? The Qualcomm Stadium tickets are now up for grabs.